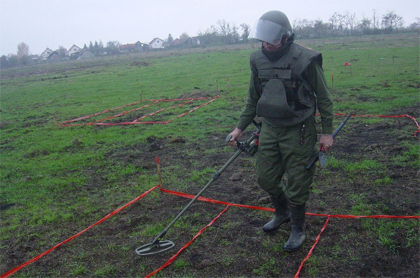 On 2 October 2015, demining operations in accordance with the project of the Mine Action Centre of the Republic of Serbia entitled "Demining project of the Paraćin - 7 location, No 0153/13, Municipality of Paraćin", an area of 577,584 m2, were completed. The contractor was "Emercom Demining", Moscow, Russian Federation. 324 pieces of unexploded ordnance were found, excavated and safely destroyed. It is a location, which after fire and explosion at a military depot in Paraćin, on 19 October 2006, was polluted by various types of unexploded ordnance. On 4 October 2015, after the completion of administrative and legal affairs in connection with this project, SMAC issued a completion certificate for the "Paraćin-7" location. As a reminder, since 2008, the Russian Federation has been providing invaluable assistance to Serbia in the field of humanitarian demining. 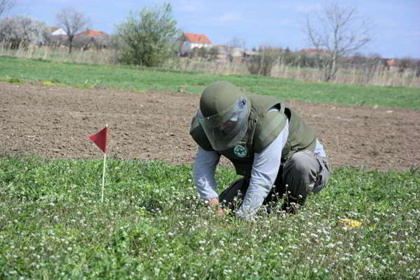 In addition to demining projects in Paraćin (9 locations), 4 cluster munitions clearance projects in Niš were completed. The total of 4,685,197 m2 was cleared and over 12,957 pieces of cluster munitions and other unexploded ordnance were destroyed. It is expected that the Russian Federation might provide funding for the next three-year period (2016-2018). Thus, in accordance with the projects of the SMAC, "Emercom Demining" would continue demining in the Republic of Serbia in the forthcoming period. The site operations under the Cluster Munitions Clearance Project of the “Sjenica -1” Location, No. 0154/14, Municipality of Sjenica, area of 129.843 sqm completed on 03 August 2015, while the administrative – legal matters related to this project completed on 24 August 2015. The project area included the area on both sides of the road Sjenica – Vapa village at the confluence of the Vapa River and Grabovica River. Contractor was Saturnia d.o.o., Belgrade, with a subcontractor Stop Mines, Pale, Republic of Srpska - Bosnia and Herzegovina. The project was funded by the US Government through the ITF Enhancing Human Security. Project management, monitoring of its implementation and quality control of the works was performed by the Mine Action Centre of the Republic of Serbia. In the period from 15 June to 3 July 2015, in Zagreb, a three-week Explosive Ordnance Disposal (EOD) Level 1 training course was held and organized by the Croatian Mine Action Centre - Centre for Testing, Development and Training (HCR CTDT). In order to enhance human resource capacities in the field of humanitarian demining in the Republic of Serbia, the Mine Action Centre of the Republic of Serbia, as the national body responsible for humanitarian demining, nominated 6 trainees from the Republic of Serbia (a representative from the Mine Action Centre and 5 representatives from the Ministry of Interior - Sector for Emergency Situations), who were joined by three trainees from Montenegro. The course was fully implemented according to the IMAS 09.30. After passing the exam, the attendees were awarded an internationally recognized certificate. The course was funded by the Ministry of Foreign and European Affairs of the Republic of Croatian from the Development Assistance Programme. On 25 May 2015, the implementation of the Cluster Munitions Clearance Project of the "Popovac" site, No. 0128/13, the City of Niš, totaling 50,321 sqm was completed. The Contractor was the Оrganization "Stop Mines" Pale, Republic of Srpska - Bosnia and Herzegovina. Location of the Project is situated on the outer side of the fence of the "Constantine the Great" airport complex, in its northwest part, so that the completion of clearance operations, apart from elimination of a risk that unexploded cluster munitions posed to local population, contributes to optimal use of that land. The City of Niš provided Contractor with all the necessary logistical support during the implementation of this project. In a wider area of the city of Niš, the Mine Action Center, in the period 2003, when it was founded and when the first cluster munitions clearance operations started until May 2015, with support from the US government provided through the ITF, but also by funds from some public enterprises ("Jugoistok" ad and Niš Tobacco Factory), as well as the donation of the Government of the Russian Federation, implemented 12 cluster munitions clearance projects, in the area of 2,150,361 sqm, where 548 pieces of cluster munitions and various types of unexploded ordnance were found and safely destroyed. 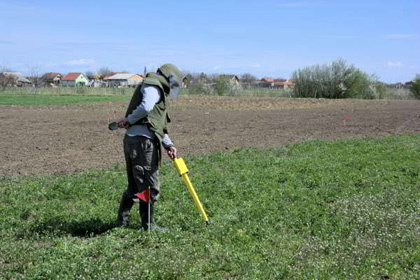 On May 28, 2015, commenced the implementation of the Cluster Munitions Clearance Project of the "Sjenica -1" site, No. 0154/14, Municipality of Sjenica, totaling 129.915 sqm. The project area includes the area on both sides of the road Sjenica – Vapa village at the confluence of the Vapa River and Grabovica River. Contractor is Saturnia d.o.o., Belgrade, with a subcontractor Stop Mines, Pale, Republic of Srpska - Bosnia and Herzegovina, and, according to the Contractor’s Operational Plan, the works will be completed in about forty days. The project is funded by the US Government through the ITF Enhancing Human Security. Project management, monitoring of its implementation and quality control of the works will be performed by the Mine Action Centre of the Republic of Serbia. Mine Action Centre of the Republic of Serbia participated in the 12th International Symposium and Equipment Exhibition "Mine Action 2015," which in the period from 27 to 30 April 2015, was held in Biograd, Croatia, under the high patronage of the President of the Croatian Parliament, organized by the Croatian Mine Action Centre and the Centre for Testing, Development and Training. The Symposium was attended by representatives of donors, international humanitarian organizations, mine action centers from Southeast Europe, manufacturers of machines and demining equipment, protective equipment for deminers and other supporting equipment and tools related to demining. Within five panels experts discussed the problem of explosive remnants of war contamination, as well as their impact during natural disasters, in the case of last year's floods that hit the mined areas in Serbia, Bosnia and Herzegovina and Croatia, followed by discussion on new technologies and equipment in mine action, where the results of projects TIRAMISU and D-BOX were presented, as well as research of the International Advanced Robotics Program (IARP). In cooperation with the Center for Security Cooperation (RACVIAC), part of the Program was devoted to the issue of cluster munitions. Representatives of our Centre gave a presentation on "Management of Remaining Risk - Serbia Case Study" and a presentation on "Rapid Response of the U.S. Quick Reaction Force Team - Serbia Case Study". Within the Symposium, at the training site "Gaj" near Skradin, a demonstration was held of demining machines, of the helicopter MEDЕVAC, training of honeybees to detect explosives, detection of explosive devices containing depleted uranium and the work of mine detection dogs. On May 5, 2015, commenced the implementation of the Cluster Munitions Clearance Project of the "Popovac" site, No. 0128/13, the City of Niš, totaling 50,321 sqm. Contractor is the organization "Stop Mines" Pale, Republic of Srpska - Bosnia and Herzegovina, and, according to the Contractor’s Operational Plan, the works will be completed in about twenty days. Location of the Project is situated on the outer side of the fence of the "Constantine the Great" airport complex, in its northwest part. The City of Niš will be providing Contractor with all the necessary logistical support during the implementation of this project. 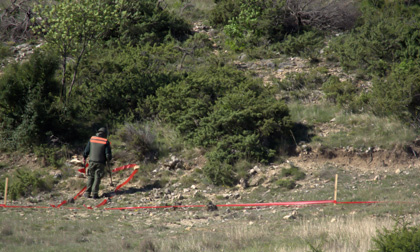 Implementation of the "Demining Project for the Paraćin-7 location" began on 27 April 2015. On this project developed by the Mine Action Center of the Republic of Serbia (SMAC), which will be conducting quality control of the works, the contractor is the Russian Federal State Agency "Emercom", namely its specialized organization "Emercom Demining", which for the seventh year in a row has been conducting demining in the vicinity of the military depot where on 19 October 2006 occurred a fire and explosion. In accordance with the contractor’s execution plan the works will last till the first half of October 2015. The project is funded by the Government of the Russian Federation within the Program of Humanitarian Demining in the Republic of Serbia for the period 2013-2015. SMAC undertakes activities to ensure that cooperation in the field of humanitarian demining continues in the coming years. In the period 14-18 April 2015, the Geneva International Centre for Humanitarian Demining EOD and Underwater Clearance Advisor, Mr Justin Smith, visited the Mine Action Centre of the Republic of Serbia (SMAC) to get acquainted with previous experiences and future plans of the SMAC in the field of underwater clearance in Serbia. 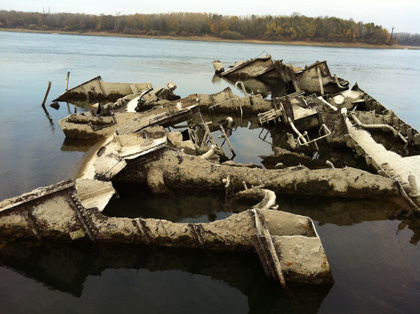 During the visit, bearing in mind that Mr Smith is responsible for developing IMAS for underwater clearance operations and collects materials and world wide practices, the SMAC organized a visit to a site in the Djerdap Gorge on the Danube, nearby Prahovo, where in 1944, German war vessels were sunken, containing large quantities of anti-ship mines and other explosive ordnance. Due to its specificity and complexity, this site stands as a unique example of an underwater clearance task whose solving calls for a multidisciplinary approach. It was agreed to intensify joint activities in this area, given the importance of underwater clearance, primarily for the safety of people. On 5 April 2015, the implementation of the Project task - survey in order to define the area suspected to be contaminated with cluster munitions at the "Vojka" site, No. 0172/15, the Municipality of Stara Pazova, a total area of 249.796 sqm, was completed. On this project, developed by the Mine Action Center, which conducted quality control of the works, the contractor was the organization Norwegian People's Aid (NPA). The project for the "Vojka" site was realized with the support of the State Department Bureau for Political-Military Affairs, through the International Foundation for Enhancing Human Security (ITF). In this way, above all, total safety of the local population has been increased, while at the same time the efficiency and cost-effectiveness in land release has been achieved. By the implementation of the Project task - survey in order to define the area suspected to be contaminated with cluster munitions at the "Vojka" site, No. 0172/15, and the Project for Cluster Munitions Clearance of the “Vojka” Location, No. 0148/13, Municipality of Stara Pazova has been declared the area free of risk from the 1999 cluster munitions. Since 2005, as declared by the United Nations (UN) 4th April has been observed as the - International Day for Mine Awareness and Assistance in Mine Action. The Mine Action Centre of the Republic of Serbia as a national mine action coordinating authority, would like to use this opportunity to remind of the fact that in the Republic of Serbia there are still mines and explosive remnants of war (ERW) that pose a threat to safety of people and environment, hinder safe exploitation of woods, cultivation of arable land, cattle breeding, as well as implementation of significant infrastructure projects. In April 2015, mines still contaminate the area of around 3.000.000 sqm, cluster munitions the area of around 6.000.000 sqm, there are more than 150 locations suspected to contain air bombs – rockets, while other unexploded ordnance contaminate the area of around 14.000.000 sqm. Total population living in the area contaminated with the above explosive ordnance amounts to over 2.000.000. The Mine Action Centre shall, within its competencies determined by the Law, continue to contribute to the fight against landmines and ERW, thus, with the assistance of donors and others mine action stakeholders, achieving the ultimate goal - Serbia free of mines and ERW. On March 27, 2015, in Belgrade, the Mine Action Centre of the Republic of Serbia, met with representatives of the ITF Enhancing Human Security, Mrs Sabina Beber Boštjančič, Deputy Director, Mr Andrej Golob, Project Manager for Serbia and representatives of the three monitor organizations - "Eksploring", Mostar, Bosnia and Herzegovina, represented by Mr Vladimir Kordić, Director and Ivan Primorac, monitor, "Trotil", Sarajevo, Bosnia and Herzegovina, represented by Mr Hikmet Šišić, Director and "Minemon" Pale, Republic of Srpska, Bosnia and Herzegovina, represented by Mr Petar Klisara, Director. In addition to an analysis of the previous successful cooperation, the meeting was an opportunity to review the modalities how to improve monitoring on the projects of humanitarian demining in Serbia. In the period 16 March -18 March 2015, the Mine Action Centre of the Republic of Serbia (SMAC) hosted the representatives of the GICHD, Samuel Paunilla, Advisor, Ammunition Technical Operations, and David Gertiser, Project Assistant, Ammunition Technical Operations, to discuss residual contamination in Serbia and the SMAC active involvement in the Management of Residual Explosive Remnants of War (MORE) project and information sharing. The MORE project explores the development of policy and practice in response to the presence of Explosive Remnants of War (ERW) in countries still contaminated by pre-1945 conflicts. 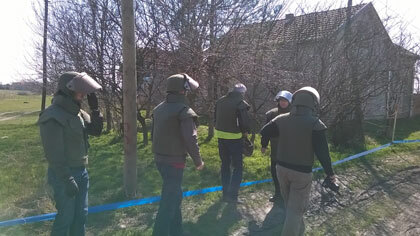 After being briefed about the current situation as regards mines and ERW still located in the territory of Serbia, as well as the needs and priorities of Serbia in the field of humanitarian demining, the GICHD representatives together with the SMAC representatives visited several locations contaminated with remaining ERW.